The lies of Sandwell council continue to unravel. I have asked two freedom of information requests about the cull of geese which took place last year and this year. Another request also revealed a little more information. This week we have a response to another request. We learn here some significant new information, which once again appears to undo some of the original claims of Sandwell council that they made officially when their pants were first pulled down about their secret cull. Before discussing this I would like to state that the person making this request is not known to me before this campaign started, and also made this request herself without orchestration. The request contained within the letter covered several points, which have attempted to rebut and which we will also look at in conclusion. It also set out to scrutinise some of the other FOI request information and statements then made by the council. Once again, the response was dealt with by Streetscene director at SMBC Steve Handley- John Satchwell’s immediate line manager. Only the personal details of the requester have been redacted below. WHAT WAS ASKED AND WHAT DID THEY KNOW? 2. The specific powers under which the culling decision was made, as devolved to the Council by government generally and specifically to the Cabinet member (Maria Crompton) by the authority. The policy direction for countryside management, nature reserves, parks, green spaces and visitors centres. Environmental services including cleansing, grounds maintenance, public conveniences and the maintenance of water courses”. 3. 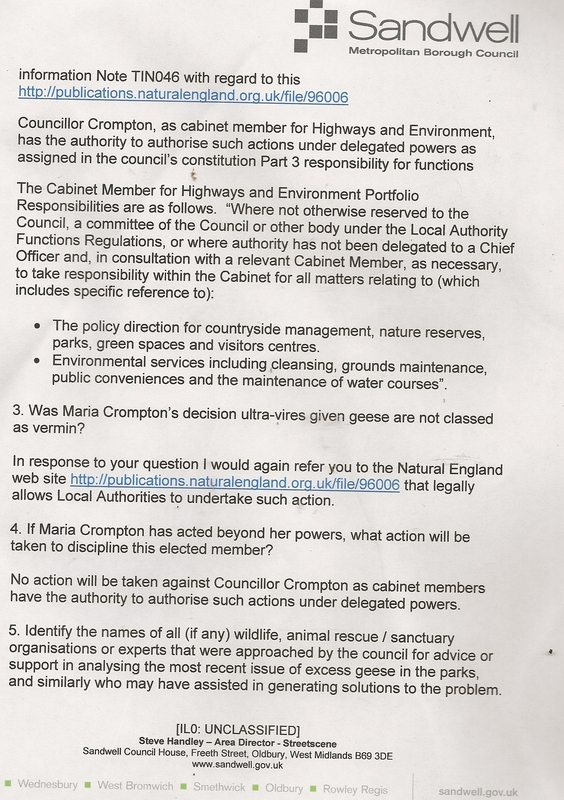 Was Maria Crompton’s decision ultra-vires given geese are not classed as vermin? 4. If Maria Crompton has acted beyond her powers, what action will be taken to discipline this elected member? 5. 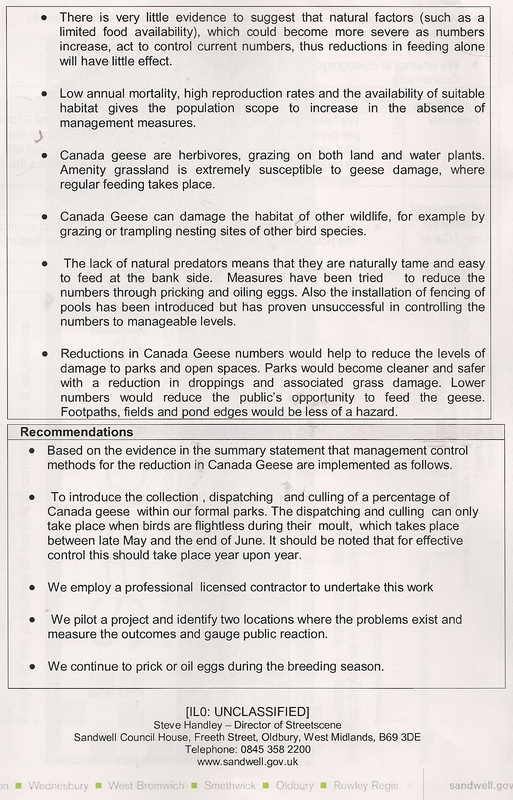 Identify the names of all (if any) wildlife, animal rescue / sanctuary organisations or experts that were approached by the council for advice or support in analysing the most recent issue of excess geese in the parks, and similarly who may have assisted in generating solutions to the problem. “Officers within the council have appropriate qualifications and experience to advise on such matters and discussions and actions on alternative control methods have taken place; from pricking eggs to planting water margin plants, fencing water edges to discouraging over feeding. These are tried and tested methods but we have still failed to reduce the numbers to manageable levels within our formal parks. One of the officers spent a number of years working for the Wild life trust and two colleagues have degrees in Environmental studies. 6. Identify the total number of other culls performed by the Council over the last 5 years, and for each, provide details of the date, the species involved and number of animals per cull, plus the specific powers used to support each decision. Sandwell council made the following statement on their facebook page and also to the media press release at the time in relation to the number of complaints concerning geese in the two parks in question where they were culled. (B) DARTMOUTH PARK WEST BROMWICH – WHERE HIS SON WAS PROJECT MANAGER. In question 1 we revealed the lies of Sandwell council and Maria Crompton in isolation. Eight complaints were made in four years, with 0 in 2010 in these two parks. Just eight to justify the murder of 220 birds to make some pathetic scumbag feel better about themselves. We would question how many of these complaints tally for each park, as this is not broken down, and would consider that with such a correlation by year that it is the same individuals or even individual making a repeat complaint. Whereas the council may have justification in undertaking action on something which is a persistent source of complaint, the number of formal complaints here does not in any way justify such a final murderous solution. 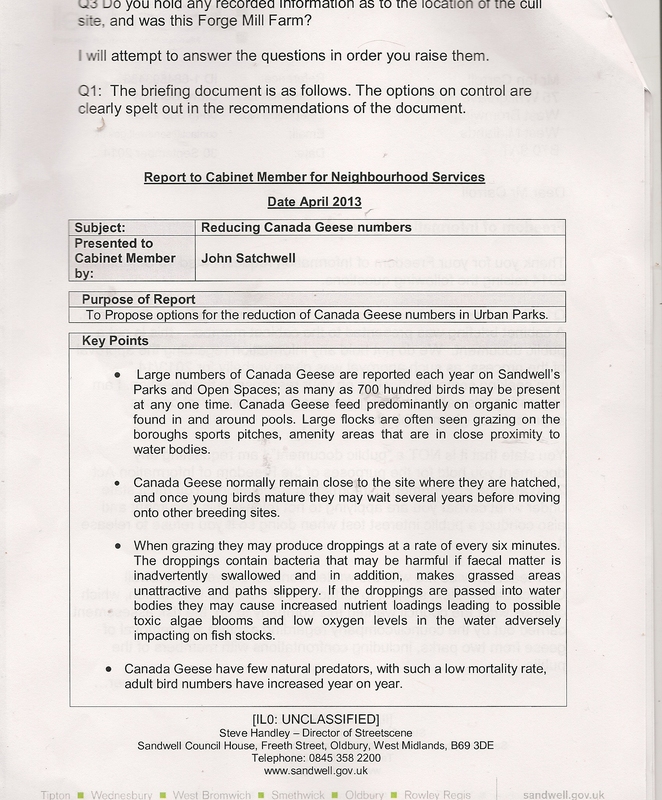 Satchwell’s report was titled “To propose options for the reduction of Canada geese numbers in Urban parks” , yet the subject of complaints never arises, just his own biased and misguided desire to murder geese- without option. Handley’s subsequent backpedalling on informal complaints is desperate and also pathetic from this director. Informal complaints do not count at all and we do not accept their lack of recording as justification in the unravelling of Sandwell council’s lies. We have spoken to Sandwell parks gardeners at these parks, both past and present, and none have stated that they have made complaints about the geese. 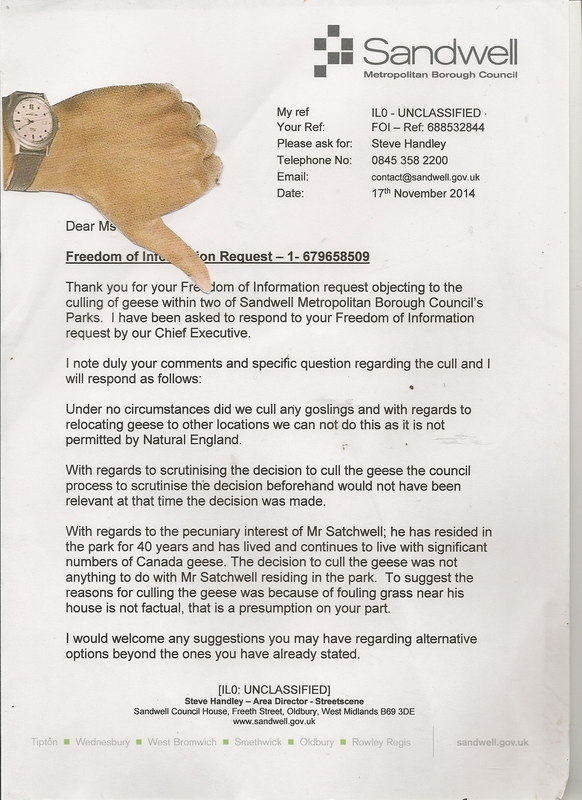 There is also doubt as to the reliability of the information supplied in answer to this request by Sandwell council. Usually, councils refuse to disclose information that would take an excessive amount of time to compile, on cost grounds, yet they are able here to plough through 5 years worth of letters that could be written on all manner of subjects, and cover a broad range of complaints, from geese fouling, to dog fouling. Were the letters entirely complaining about the geese or about bird mess in general? 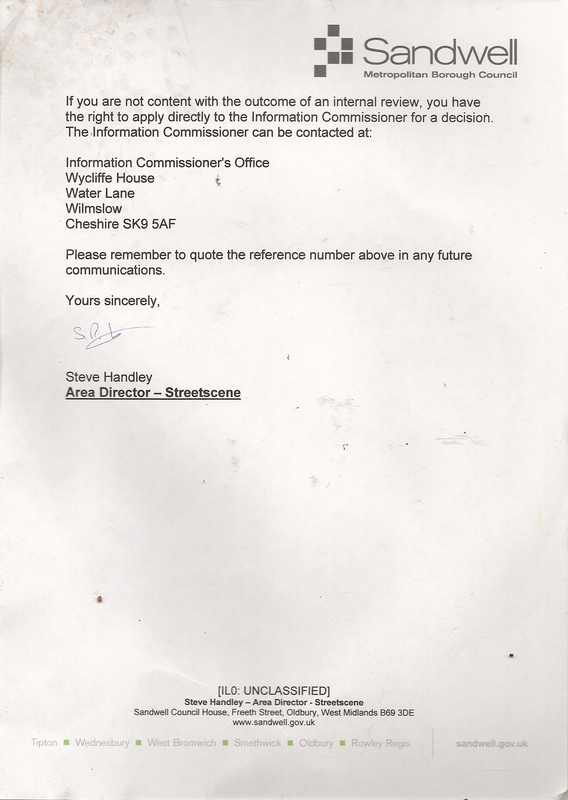 – We do not have the letters, so we are left to Sandwell council’s reliability on this matter. 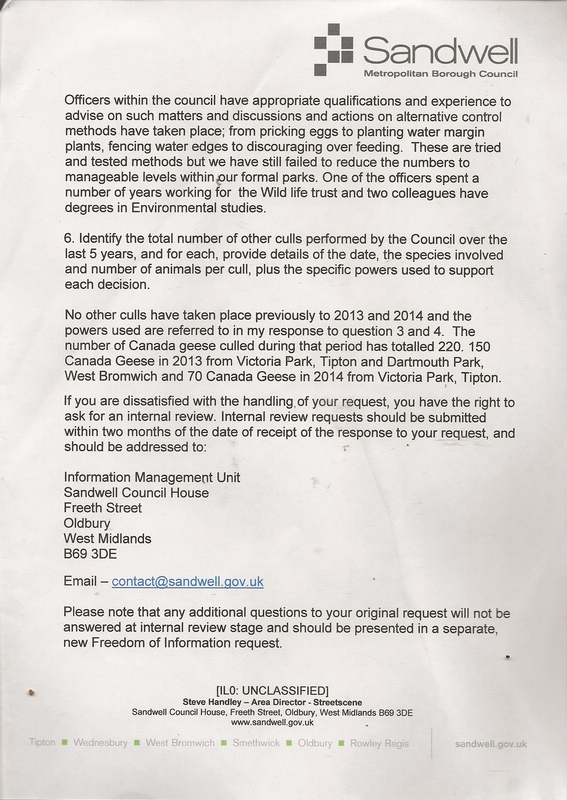 2/3/4 In questions 2-4 Sandwell council hide behind a Natural England document that they appear to have found, (or I believe have been advised on by Natural England) subsequent to the cull and not in possession of before it. Behind the legalise of powers deferred to Crompton, we learn that she had the final say on approving Satchwell’s misguided report, and that she does not appear to have even scrutinised anything that he says within it. WE LEARN THEREFORE THAT SHE IS REPSONSIBLE ULTIMATELY FOR 220 BIRDS BEING MURDERED BASED ON COUNCIL OFFICER LIES, AND THAT SHE HAS BLOOD ON HER HANDS FOR THIS. THIS IS THE WOMAN WHO ALLOWED 220 BIRDS TO BE KILLED, AND SIGNED OFF THE MURDER OF A REPUTED 150 IN THIS SAME YEAR, JUST MONTHS EARLIER,BEFORE THE FENCE WAS INSTALLED. DOES SHE HAVE SELECTIVE AMNESIA ABOUT THIS? The detrimental impact of breaking their necks seems to have been forgotten by her. We know that egg pricking was not being carried out at Dartmouth park in particular for many years, where it would not be uncommon for around 40 goslings to be creched together around the duck pond. 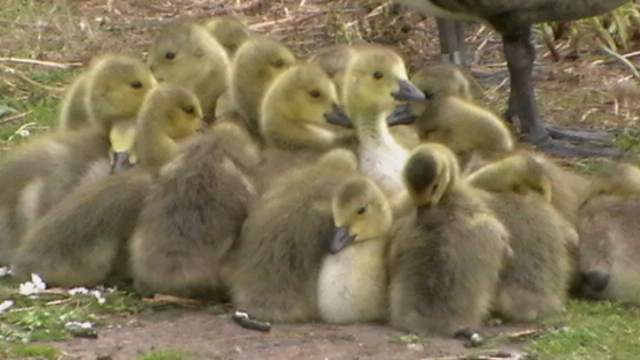 The picture that we have used of goslings grouped together was taken in 2011 at Dartmouth park. Here they are when they were older at the duck pond. “You can’t ever remember any report being written about anything like this about exterminating or culling geese? WE WOULD NOTE THAT THE CULL AT VICTORIA PARK TIPTON IN 2014 WAS PERFORMED ON A DAY WHEN CHRIS MOORE, MATT DARBY AND PAUL SMITH WERE ALL ALLEGED TO BE ON ANNUAL LEAVE- WAS THIS DELIBERATLEY ARRANGED SO THEY COULD ALL DENY ANY KNOWLEDGE OF EVENTS? 6. We believe that geese went missing from Dartmouth park in 2014 and not 2013 as stated. Individual and distinctive geese disappeared from this site. This just adds to the mystery of why geese on Victoria park Tipton were culled again in such numbers- on the basis of what complaints- 2? THE WRITTEN LETTER IS DETAILED BELOW. In response to some of the comments made by Steve Handley we respond as follows beneath each page. 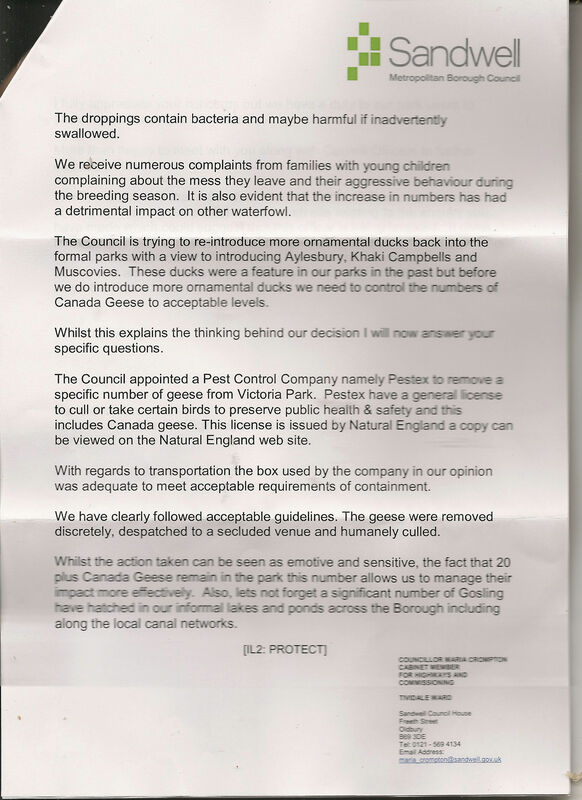 We do not know if any goslings were culled- and why really should this even matter? THEY ADMIT TO KILLING 220 BIRDS-AGE IS NOT RELEVANT- THEY WERE FLIGHTLESS AND HELPLESS UPTO THE POINT WHEN THEIR NECKS WERE BROKEN BY COWARDS. WE ALSO DON’T TAKE ANY WORD OF THIS COUNCIL AS TRUTH BASED ON EXPERIENCE. The officer decision appears to be final- without any scrutiny, or what their motive may be- in John Satchwell’s case a pecuniary one undeclared. We are told here that he has lived in Victoria Park for over 40 years. We also know that he started his long career at Sandwell as a gardener. We do not accept Handley’s claim- John Satchwell’s report and subsequent decision to choose this site in his pilot cull has everything to do with him living in this park- only Sandwell council would not see that because they believe themselves to be devoid of criticism and scrutiny over personal declarations of interest, as does their so called “monitoring officer”- little more than a taxpayer funded legal aid for dodgy councillors. 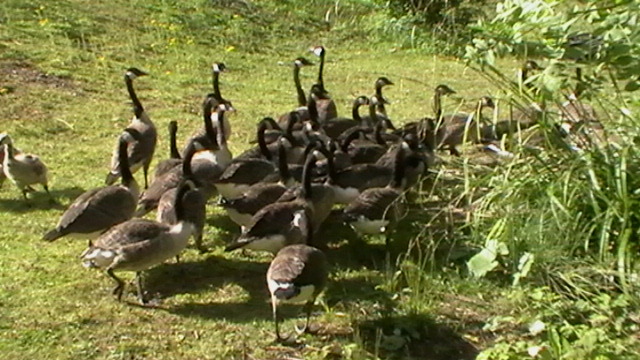 So the geese were not and are not fouling on the grass near his house (on amenity grassland that his report speaks of). So now we know the truth. Geese in the areas in question are not “migratory” in the real sense of the word. They moult at the sites in the summer- when the council takes this opportunity to catch them in large numbers. The inconsistency in the numbers shows a rubbish understanding of the birds; movements- one not based upon any observation at all- just wild guess work from office based turd holes in Sandwell’s parks department. 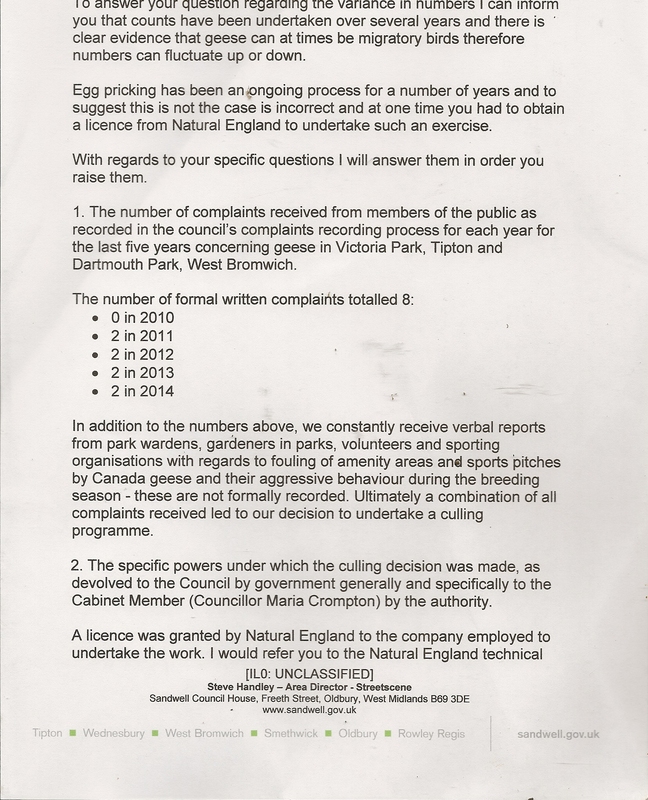 In terms of egg pricking- evidence above confirms Sandwell council’s and Steve Handley’s claims to be incorrect and not based on fact at all.